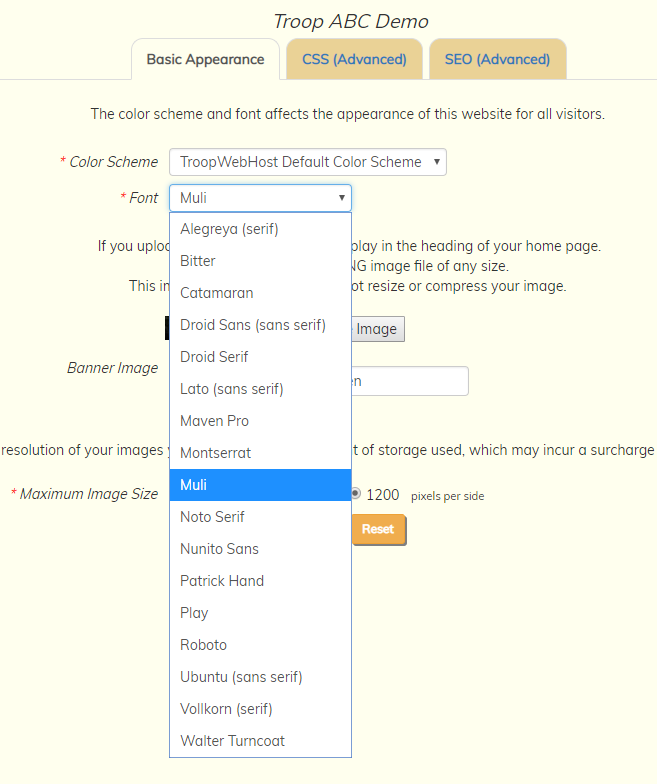 TroopWebHost now supports Journey To Excellence data collection and reporting for Scout Troops. Next month we will extend this capability to Venturing Crews. There is a significant amount of configuration and data entry required before you can produce the Journey To Excellence reports. A "Recharter / JTE Coordinator" user role has been added to your site. This role enables all of the Journey To Excellence capabilities. 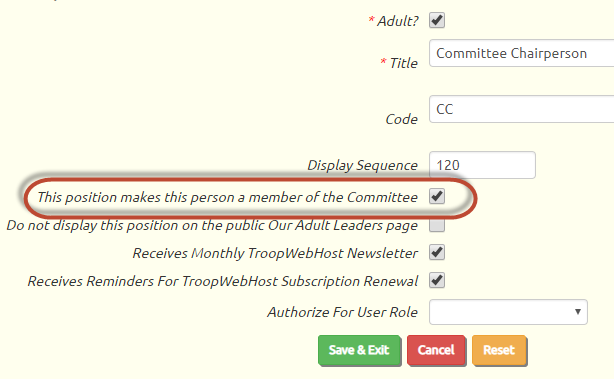 You can assign this to the appropriate leaders by going to Administration → Assign User Roles. Find "Recharter / JTE Coordinator" on the list of roles and click Assign To Roles. Then put a checkmark next to the names of each person who should have this capability. To produce the report, we needed a way to identify the adult leaders who belong to the committee. We added a checkbox to the Leadership Position page to facilitate this. Please go to Site Configuration → Leadership Positions and update each adult leadership position that would be a member of the Committee, making sure this box is checked. The Den Chief position for scouts will have a name that begins with "Den Chief". The Scoutmaster position will be named "Scoutmaster" and will have a position code of "SM". Any leadership position with a title beginning with "Assistant Scoutmaster" or with a position code of "SA" will be assumed to be an Assistant Scoutmaster. Journey To Excellence has a number of training requirements. In order to track these, we added several checkboxes to the Training Course page. Any course that qualifies as position-specific training for Assistant Scoutmasters should have the first box checked. Any course that fulfills the position-specific training requirement for Committee members should have the second box checked. Any advanced adult leadership course of 5 days or longer should have the third box checked. Check this box for any scout training course that qualifies as advanced training, like NYLT or Order of the Arrow Conference. The adult leadership record now tracks when a leader completes all of the required training for that position. This field must be entered manually; it will not be auto-completed based on the completion of one or more courses. Enter the date this person completed the required training for this position, then click Save & Exit. 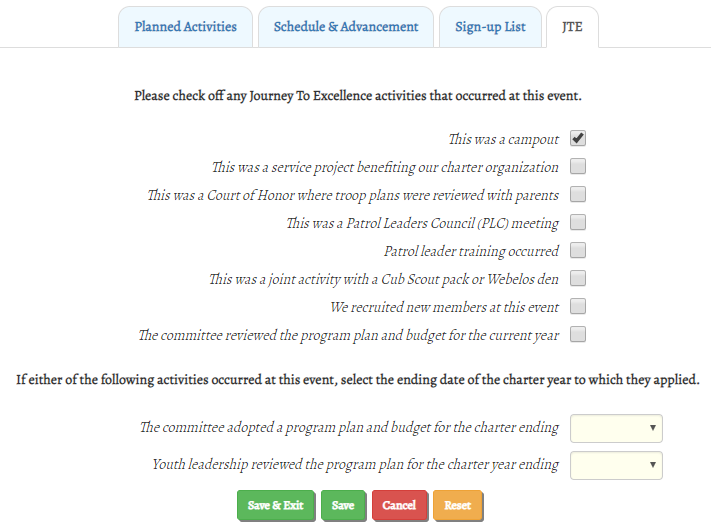 Users with the Journey To Excellence user role will see an additional tab when they update an event. You will need to review all events in the year for which you wish to to produce the Journey To Excellence reports, to ensure that the appropriate boxes are checked on each event. A committee meeting at which the program plan and budget for the upcoming year were approved. A meeting with youth leadership to review program plan for the upcoming year. The Journey To Excellence report assumes that you are using the new recharter process to track who was included in each year's recharter. Please go to Membership → Recharter → Recharter Years to maintain this information. The members selected in each Recharter represent the members who were registered at the beginning of that charter year. From the Recharter Years page, as shown above, select the year for which you wish to produce the Journey To Excellence report. To produce a complete report for the year currently in progress, you must have already created a Recharter Year record for the following year and selected the members who are included in that recharter. Update the current year and click on the new JTE tab. Select the Journey To Excellence report definition for the appropriate year and unit type, then click Save. Then click the Compute JTE Statistics button to collect the current JTE data for this year. This can be done as often as needed for a given year, as you make corrections to the underlying data. 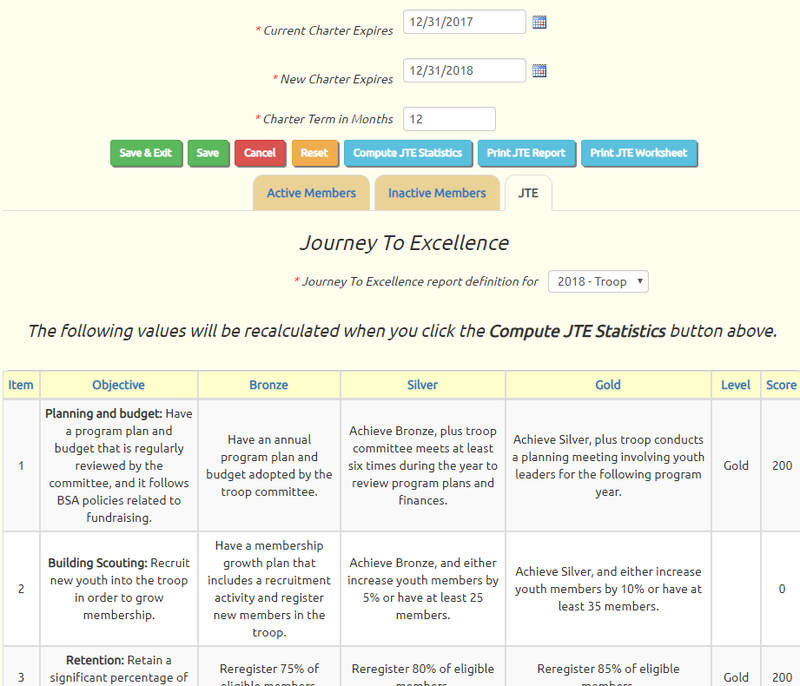 Click the Print JTE Report button to produce the Journey To Excellence report. The Journey To Excellence reports may also be used to review your plans for the upcoming year. 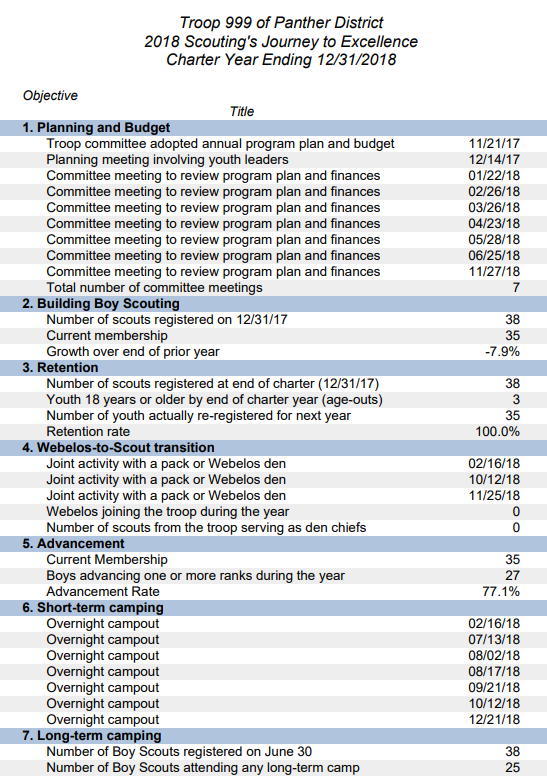 While a complete report cannot be produced until you have completed the recharter roster for the following year, it can confirm that you've scheduled the required number of planning meetings and short term camping trips for the upcoming year. When we announced the new recharter process last month, the Recharter Year didn't have any tabs. Now it has three. We've already discussed the "JTE" tab. The other new tab is "Inactive Members". At the time you select the members to be registered for a new recharter, they are all active. However, when you return to that year at a later date, some of the members may have left the troop or aged out. 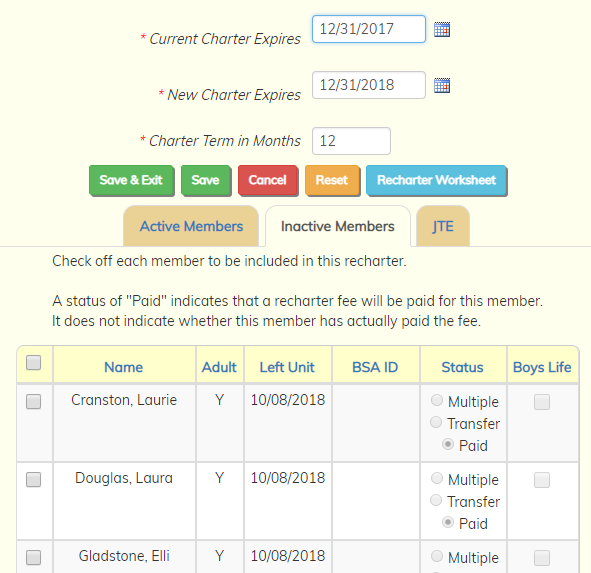 The Inactive Members tab lets you view the currently inactive members who were included in that recharter. For a given meeting, scouts may be required to wear the "Field Uniform" (aka "Class A") or the "Activity Uniform", (aka "Class B"). Other events may allow street clothes or special gear. 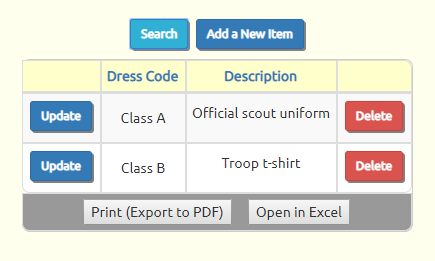 You can now define the various classes of dress and assign them to each event. Please go to Site Configuration → Dress Codes to create the dress codes recognized by your unit. Once you selected a dress code for an event, that dress code and description will be displayed when you select that event from the calendar. As you would expect, the ability to specify a dress code for an event is controlled through the Event Type. We've enabled this option on all existing Event Types in your system. If you don't want to be prompted for dress codes, please go to Site Configuration → Event Types and disable the "Display Dress Code" option on each event type. 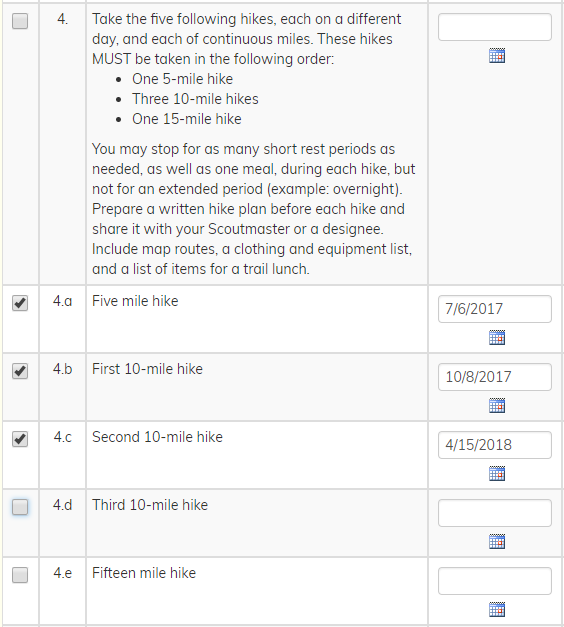 You can now track the individual hikes that complete requirement 4 for Hiking merit badge. We've broken the individual hikes into subrequirements, as shown below. You've always had the ability to customize the appearance of your site by selecting from a list of Google Fonts on the Site Appearance page. We recently added four new fonts to the list. Can you guess which ones they are?